Airlines In Turkey And Dubai Cleared From Laptop Ban : The Two-Way Turkish Airlines and Emirates announced they are now exempt from the ban on carrying electronics larger than a smartphone into the cabin on flights bound for the U.S.
Emirates passenger planes at Dubai International Airport. The airline announced it is now exempt from the laptop ban imposed by the U.S. Department of Homeland Security in March. 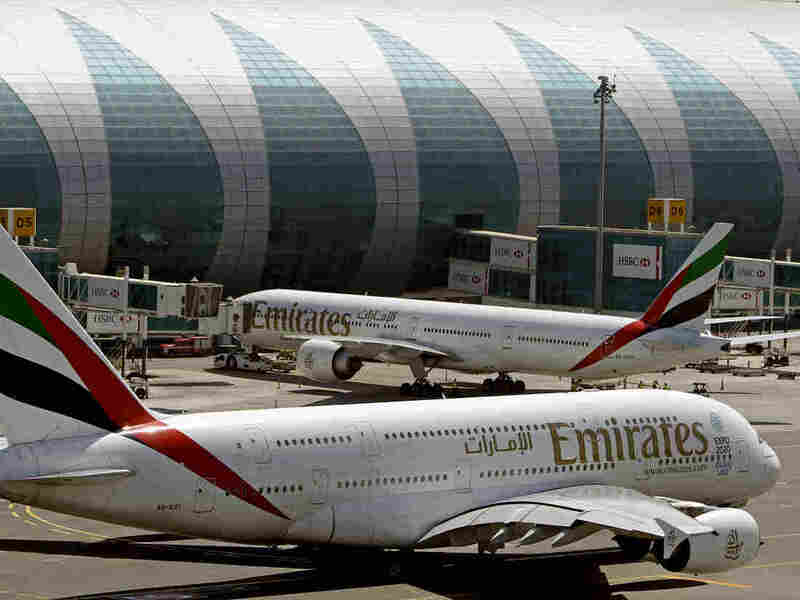 Two airlines in the Middle East say they have been exempted from a 2-month-old ban on carrying large electronic devices aboard direct flights to the United States. Emirates, the Middle East's largest long-haul airline, said in a statement Wednesday that the ban was lifted, "effective immediately," on Emirates' flights from Dubai International Airport to the U.S. Also on Wednesday, Turkish Airlines announced the ban was no longer in place for its travelers departing the Istanbul Ataturk Airport for American destinations. U.S.-bound flights out of Etihad Airlines of Abu Dhabi International Airport were cleared Sunday. (Etihad is the only airline with direct flights to the U.S. out of Abu Dhabi International.) The news suggests all three airports have met newly heightened standards by American security officials, according to the Associated Press. Turkish airlines CEO Bilal Eksi tweeted Tuesday that he also believed a similar ban on large electronics on U.K.-bound flights would be lifted soon. As NPR has reported, the Department of Homeland Security instituted the rule against bringing electronic devices larger than a smartphone into airplane cabins in March, citing no specific threat but pointing to continued efforts by terrorists to target aviation by installing explosives in consumer products. The ban did allow for larger electronics to be stowed in checked luggage. The Department of Homeland Security order affected 10 airports in eight countries in the Middle East and North Africa (Turkey, United Arab Emirates, Saudi Arabia, Qatar, Kuwait, Jordan, Egypt and Morocco). As NPR's Greg Myre noted, unlike the list of largely poor and troubled countries included in the Trump administration's controversial travel ban, the laptop ban targeted eight stable, in some cases wealthy, American allies. "You think of these countries on the airline list, and you're talking about a wealthy businessman, jet setting around the world," Greg said. The ban did not affect U.S. carriers flying from the 10 airports. In the cases of the airports in Istanbul and Dubai, Turkish Airlines and Emirates are, respectively, the only airlines operating direct flights to the U.S. Shortly after the United States instituted its ban in March, the United Kingdom followed suit, with a similar ban on large electronics affecting a slightly altered list of airports and countries. The U.K.'s ban did include British-based airlines. In June, the Department of Homeland Security raised the possibility of expanding the laptop ban to direct flights from Europe to the U.S. However, the Department of Homeland Security ultimately avoided such a move and instead announced new security standards in late June for all commercial flights from abroad into the U.S. The standards include everything from improved screening equipment to better explosives-detecting dogs. At the time, Homeland Security Secretary John Kelly cited the downing of a Russian Metrojet plane in 2015 as it departed from Egypt as an example of terrorists' sustained focus on air travel. Kelly warned any international airport that did not meet the new standards "could be subject to other restrictions, including a ban on electronic devices on aircraft or even a suspension of their flights into the United States." On Tuesday, Saudi Arabian Airlines said it expects the laptop ban to be lifted on its U.S.-bound flights by July 19.